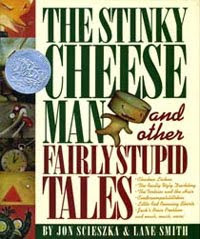 Brimful Curiosities: Celebrating Jon Scieszka: The Stinky Cheese Man / Smash! Crash! Celebrating Jon Scieszka: The Stinky Cheese Man / Smash! Crash! One of my all time favorite garage sale finds is a pristine hardcover copy (dust jacket included) of The Stinky Cheese Man and Other Fairly Stupid Tales by Jon Scieszka, illustrated by Lane Smith. I paid the large sum of 25¢. Such a HUGE bargain, I could barely contain my excitement! The owners obviously never even cracked the book open to read it, otherwise they would never have parted with this classic jewel. Or maybe the scary Giant in the story forced them to sell the book, threatening that he would grind their bones to make his bread if they didn't follow through with the sale. Whatever the case, I ended up with one of the greatest books for reading aloud ever written. Being the crazy mother that I am, I shelved the book with all of my daughter's other picture books and, of course, she wanted to read it. Even though the recommended age is five and up, I decided that a three year old (at the time) might enjoy some of the stories. Maybe. So we read it together. In parts. I was slightly concerned she might find the stories horrifying - after all, the illustrations and stories are a little on the dark side and odd. She loved reading it. It was at this moment that I realized my daughter must have a pretty good sense of humor because she thought the book was insanely funny. Laugh out loud funny. Pulling the book off the shelf every night, wanting to read it funny. Ridiculously funny fairy tales are apparently hit in our house. This Caldecott Honor Book deserves a special spot in every library. Now, I will add that I enjoy using silly voices when I read books out loud. My daughter loves the silly voices and there are plenty of opportunities to use voices when reading The Stinky Cheese Man. Her favorite parts are the Giant with Jack the Narrator and the story of Little Red Running Shorts. Thanks to this book, she also knows the location of the title page, what uppercase letters look like and what constitutes a table of contents. How's that for educational? Seems the Scieszka mania has carried over to my toddler son as well. That's not all that surprising. Scieszka obviously knows boys (he grew up with five brothers and no sisters). The mission of his Guys Read website is to motivate boys to read by introducing them to materials they will find interesting. Scieszka has authored a picture book series called Trucktown that my son absolutely adores, especially the book Smash! Crash! The book follows the crazy truck pals Jack Truck and Dump Truck Dan as they smash and crash their way through Trucktown while trying to avoid a mysterious large shadow with a loud, booming voice. I checked out a copy of Smash! Crash! last week from the library and my son makes everyone who enters our home read it to him. Multiple times. Smashing and crashing apparently appeals to the little guy, what can I say? Guess we'll be buying our own copy immediately. Our public library doesn't appreciate it when we don't bring the books back, and I don't think we'll be able to live without this one. My daughter even enjoys reading it and likes the girl trucks Gabriella Garbage Truck and Grader Kat. Look closely at the cover and you'll see not just one but THREE awesome illustrators listed, David Shannon and Loren Long and David Gordon. One small little issue though...the smashing and crashing has carried over to my son's imaginative play. Mommy doesn't appreciate large metal dump trucks smashing into her legs. Dump trucks leave bruises. Pure genius. That is Scieszka. He had to be just in order to learn how to spell that last name! (Hee, Hee). Kidding aside, on January 2008, the Library of Congress named him the first National Ambassador for Young People’s Literature. Scieszka's platform during his two year term as National Ambassador has been to reach reluctant readers. His term ends tomorrow, and, as a tribute to his work in the field, several book bloggers are posting about Scieszka today and leaving their links at A Year of Reading. Read a few more posts if you have time! I love The Stinky Cheese Man! Great humor and illustrations! I have read Smash! Crash! 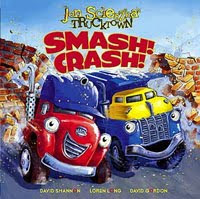 to lots of kids and they do all love to smash and crash! Thanks for the Family Love, Brimful. Sorry about the dump truck bruises. Just keep thinking of all of the money you saved on that 25¢ Stinky.